August 1, at Nizhny Tagil, around 35 stone tombs and a few crosses in the city cemetery were destroyed. Police arrested a 20 year old person. He has already confessed that he was guilty in this crime. Occult and satanic literature was found at his house. The arrested person was working in one of the retail shops in the city, and detectives assume that there would be more people involved in the cemetery vandalism. The young man calls himself a satanic cult follower (satanist) and says that he destroyed the tombs because he hates all the things connected with Christianity. That’s why the broken crosses were put back in the ground up side down. 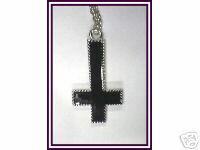 I used to know some teens that had some crosses like those back in high school!